DEMOCRATS ARE MOVING quickly to try to roll back President Donald Trump’s declaration of a national emergency to siphon billions of dollars from the military to fund construction of a fence along the US-Mexico border. Today’s vote in the Democratic-controlled House of Representatives comes on legislation to revoke Trump’s executive order from earlier this month and would send it to the Republican-held Senate, where it would take only a handful of Republican defections to pass it. Trump is likely to prevail in the end since he could use his first-ever veto to kill the measure if it passes Congress, but the White House is seeking to minimize defections among the president’s Republican allies to avoid embarrassment. The vote could be challenging for Republicans who view themselves as conservative protectors of the Constitution and the powers of the federal purse that are reserved for Congress. But GOP-vote counters are confident that the tally won’t get near the two-thirds that would overturn a Trump veto. 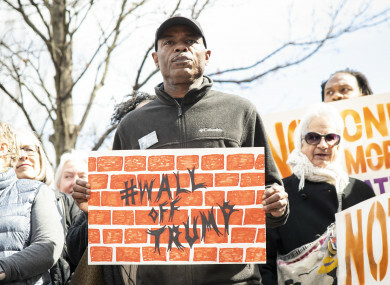 Democratic leaders said yesterday that the vote is not about the merits of Trump’s wall, but how Trump is trampling on the Constitution by grabbing money that he can’t obtain through normal means. “The beauty of the Constitution, the heart and soul of the Constitution, is the separation of power – co-equal branches of government to be a balance of power,” said House Speaker Nancy Pelosi, D-California. The Constitution spells out the responsibilities, giving the Congress of the United States, among other powers, the power of the purse. The president’s power grab usurped that constitutional responsibility and fundamentally violates the balance of power envisioned by our founders. Trump took to Twitter yesterday to urge Senate Republicans to stick with him. “I hope our great Republican Senators don’t get led down the path of weak and ineffective Border Security,” Trump wrote. Without strong Borders, we don’t have a Country – and the voters are on board with us. Be strong and smart, don’t fall into the Democrats ‘trap’ of Open Borders and Crime! Trump’s declaration of a national emergency gives him access to about $3.6 billion in funding for military construction projects to divert to border fencing. Politicians in both parties are recoiling at the politically toxic prospect of losing cherished projects at back-home military bases. The Defense Department has not identified which projects may face the axe. Trump’s edict is also being challenged in the federal courts, where a host of Democratic-led states such as California are among those that have sued to overturn the order. The House of Representatives may also join in. Email “A vote on revoking Trump's emergency US-Mexico wall funds takes place today ”. Feedback on “A vote on revoking Trump's emergency US-Mexico wall funds takes place today ”.